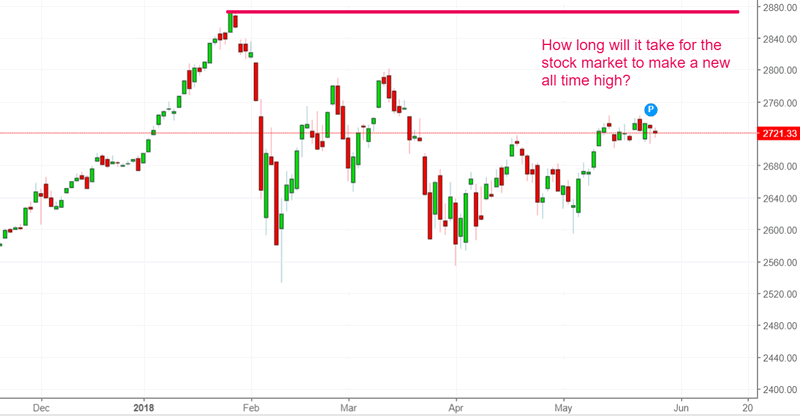 Stock Market Study: How Long After a 10%+ “Small Correction” to Make New Highs? The S&P 500 made a 10%+ “small correction” from January- February 2018. In a previous study I looked at how long it usually takes for the stock market to go from its correction bottom to a new all time high. In today’s study I’m going to look at how long it usually takes for the S&P 500 to go from an old all-time high to making a new all time high. Here are the historical 10%+ “small corrections”, as defined by the Medium-Long Term Model. Here’s how long it took for the S&P to go from a pre-correction high to a new post-correction high. It took 98 days for the S&P 5 make a new all time high. It took 58 days for the S&P to make new highs. It took 54 days for the S&P to make new highs. It took 85 days for the S&P to make new highs. It took 40 days for the S&P to make new highs. It took 52 days for the S&P to make new highs. It took 78 days for the S&P to make new highs. It took 102 days for the S&P to make new highs. It took 68 days for the S&P to make new highs. It took 147 days for the S&P to make new highs. It took 92 days for the S&P to make new highs. Here’s how long it took historical 10%+ “small” corrections to make a new high. As you can see, it usually took 2 – 5 months for the S&P 500 to make a new all time high. There was one exception that took 7 months. This study suggests that the S&P 500 will probably make a new high by the end of June 2018 (5 months from January 2018). It should definitely make a new high by the end of August 2018 (7 months from January 2018).